Knitting Relaxes Me: Viva Fiesta! This is Fiesta week in San Antonio. Fiesta is an annual 10-day party that includes events all over San Antonio. It started in 1891 with the Battle of Flowers parade to commemorate the Battle of San Jacinto. Now it includes three big parades - the Bttle of Flowers (a.k.a. the Day Parade), Fiesta Flambeau (the Night Parade) and the River Parade, where the floats really do float. Luckily, it's cooled off a little bit - I think yesterday the high was around 90 - so we'll only be sweaty, not miserable, during Fiesta. 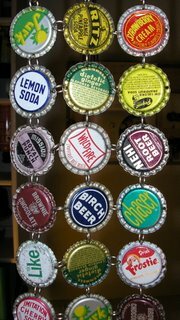 It's a 6-foot-long panel made of vintage bottle caps. The panel isn't solid bottle caps - there are about 50, divided up in sections like this one. The sections are connected with key-chain chain (if you know what I mean). For the last six years, I've been trying to figure out how to sort of disguise the entrance to my pantry/laundry room from the kitchen. The entrance is fairly narrow, so I think 3 of these panels will do, hung from a curtain rod. They're a little pricey, though, so I'm starting with this one. Luckily the artist is local so I can acquire more periodically. But I just love it! It the right combination of funky and food-related that my kitchen needs! There is some knitting news. Remember my Chevron Scarf (which I have to admit isn't done yet - I promise it will be done by winter)? 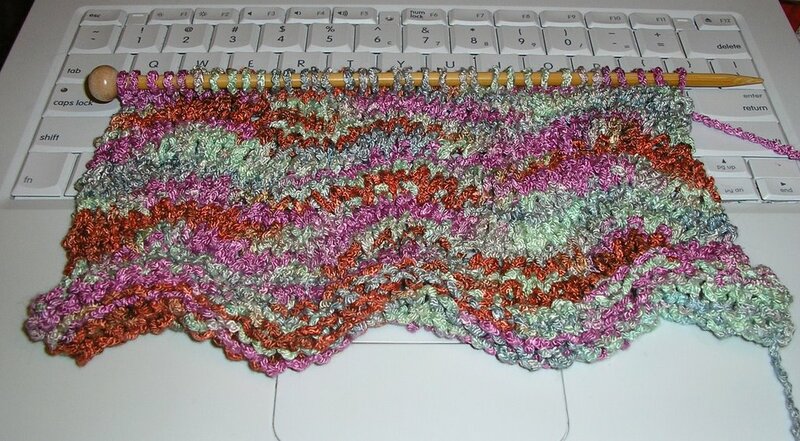 Well, here's her little sister -- Chevron Scarf II, made out of one of the unidentified yarns I got at the yarn swap. Last winter, one of my cousins admired the Chevron Scarf, which was about 2 inches long at the time. Her birthday is in about 3 weeks, so I need to knit, knit like the wind. Although this one should go faster, since it's 36 stitches on size 8 needles, compared to 72 stitches on size 6s. I really think size 9s might be better but it's too late now!